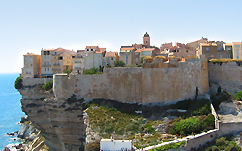 Located in the western Mediterranean Sea, Corsica has always been a meeting point for peoples and routes. Legend has it that the Greeks called the island, Kallístes (la plus belle). Even today, the French call it “l’île de Beauté”. Corsica is an authentic ""mountain in the sea"" cut in half from north-west to south-east, by a formidable system of mountain ranges with peaks over 2,500 meters in height. It also called the green island: in fact, the Regional Natural Park covers two-thirds of its surface. The numerous hiking trails offer a unique perspective of the Corsican environment. Along the cost, the climate is generally Mediterranean, with hot and dry summers and mild, rainy winters. However in the mountainous areas the weather is colder and snowier depending on the altitude. Because of its size (approximately 8,800 km2) the uneven conformation of the island has fostered a strong sense of identity. The old Corsican culture, perpetuated by centuries of customs and traditions, is expressed in its music, crafts and gastronomy. The ""Routes des Sens Authentiques"" allows visitors to travel freely through each micro-region and discover the local specialities. Given the nature of its territory and thanks its long history, Corsica has a vast wine production. In particular, the north and south of the island (the towns of Bastia, Calvi, Patrimonio, Porto-Vecchio and Sartene) are renown for the cultivation of Vermentino wine. As they say in the Corse land ""A la santé!""